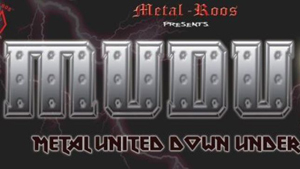 Metal United Down Under (MUDU) has recruited promoters from all eight Australian states and territories to join for a united night of Metal on October 10. From Hobart to Darwin and Perth to Brisbane, Metal will again spread over Australia under the MUDU banner. 19 promoters in 16 cities have joined the MUDU project which tops last year’s MUDU when 13 cities in seven states/territories participated. The promoters organized shows with a total of 90 Australian metal bands. This huge event now promises to get even bigger with more cities and the 100 band mark should be reached comfortably. Cities participating in MUDU are: Adelaide, Bendigo, Brisbane, Bunbury, Bundaberg, Byron Bay, Canberra, Darwin, Gladstone, Hobart, Melbourne, Nambour, Newcastle, Perth, Sydney, Wollongong. MUDU’s aim is to give Australian artists another avenue for exposure and raise further international awareness for Australian metal.